"To Uphold the Sarawak Constitution and the Nine Cardinal Principles of the White Raja" was the promise by the Queen of Great Britain to the people of Borneo. I asked Zainnal Ajamain, the author of the book, The Queens Obligation what does the statement really mean and its significance? Zainnal patiently and carefully explained to me one more time. 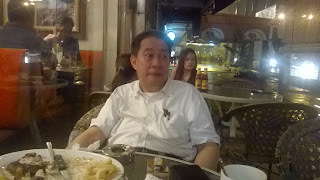 He told me The Malaysian Agreement 1963 is an International Treaty between Great Britain, Malaya, Singapore, North Borneo (Sabah) and Sarawak, which is not enacted by the Malaysian Parliament. Therefore, if the treaty is breached by one of the parties to the agreement, the Malaysian Constitution or the Malaysian Parliament cannot arbitrate the grieving partners. We have no choice but to refer back to those responsible for the agreement. Since the Malaysian Agreement 1963 was signed in London, therefore Her Majesty the Queen is the rightful Trustee to this agreement. So we go back to her said Zainnal. Zainnal told me there was this British Officer who bent over backward to provide safeguards and caveats to North Borneo and Sarawak, especially North Borneo in the form of Inter-Governmental Committee (IGC) and the Malaysian Agreement 1963. He was none other than Sir William Goode. Sir William Goode is the forgotten hero for the people of Borneo. According to Zainnal, the Malayan representatives who signed and witness the Malaysian Agreement 1963 were not happy with Mr Goode because he was too demanding; in making sure the people of Borneo who was about to be part of Malaysia will not be in a disadvantage position. Among the safeguard for the people of North Borneo that was overlooked is that 40% of the tax revenue collected from North Borneo MUST BE CHANNELED BACK TO HER! Nowadays, the Federal Government collected the taxes, but disburse back to North Borneo (Sabah) annually in a form of Federal Grant; far smaller than the 40% as stipulated in the Malaysian Agreement 1963. 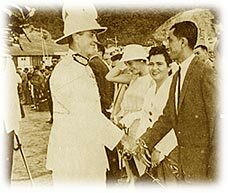 Sir William Allmond Codrington Goode, born in 1907, was a British Colonial Officer who served as Governor and Colonial Secretary to various stations of the British Empire in the East. In fact, he was the last Governor of the Crown Colony of Singapore and the British Protectorate of North Borneo. He joined the Malayan Civil Service in 1931. When Singapore fell to the Japanese in 1942, Goode became the Japanese prisoner of war and was sent to work at the Burma Railway in Siam (Thailand) from 1943 to 1945. Goode died on 15th September 1986, one day earlier from the day and month of the birth date of Malaysia (16th September). Also see my blog post The Queens Obligation. To know more about the Malaysian Agreement 1963 as well as the Queen's pledge Zainnal can be contacted at 016-8194556 or his assistant Mike Govind at 010-7661788. His book is sold at RM65.00 per copy. The forward message of this book is written by the honorable Malaysian Foreign Minister Mr Anifah Aman.